With the beginning of a new year comes new goals and resolutions. We all know this to be true. January takes the prize when it comes to crowded workout facilities. People flock to the gym to spend countless hours putting their bodies through intense workouts to try to get back in shape. How many people do you know that have this new goal each year and drop it after a few weeks? One of the reasons being that their bodies run out of steam, because well frankly, it’s just too much! So, what if I told you that your New Year’s resolution to become a stronger, healthier you doesn’t involve enduring dreaded sweat sessions at the gym. A consistent yoga practice may be the workout you’ve been looking for, and it’s right at the edge of your grasp. As you flow between movements, your body gets the exercise it needs without having to push yourself to the brink every time you want to burn calories. Don’t cringe at the thought of exercise. Instead, look forward to it because you love the way it makes you feel. It’ll change your life. The positive impacts of yoga on your health are innumerable. If you want a behind-the-scenes look at the benefits of yoga and what it can do for your body, listen to what one of our students has to say! Two of the most common contributors of unhappiness in our day-to-day lives are stress and chronic pain. Stressors are always present, whether it’s stress from work or kids or whatever else might be going on in your life. But for an hour or an hour and a half out of the day, you can escape them all. Yoga gives your body and mind time to calm down, re-connect and feel rejuvenated, alleviating any anxiety or stress. It gives you back a sense of power to charge on and conquer any challenges life throws your way. If you live with back pain or another form of chronic pain, take a few yoga classes and you’ll start to see a drastic change in the way you feel. Studies show that practicing yoga and meditation reduces pain for individuals with arthritis, back and neck pain and other chronic conditions. How incredible would it be to say goodbye to pain that wears you down? That can be your reality. Yoga as a whole increases your strength and flexibility. Using your body weight in a yoga class creates toned and lean muscle in your legs, arms and abdominals. Hang up the weights and let your body get stronger on its own. For those of you shaking your head that yoga is a workout, have you ever tried a warm or hot yoga class? You don’t know the meaning of a sweat session until you have! They get your blood pumping and give you a full-body workout. If that’s not for you, there are a multitude of other styles of yoga to try that are less intense. These are all amazing benefits, but the best part about yoga is that it’s about YOU. It’s about your journey, your pace and how you feel. It’s not a competition, and you don’t have to run yourself into the ground every time you want to exercise. It’s a new year, and the timing couldn’t be more prime to start making those steps towards becoming a better, healthier and stronger you. But don’t take my word for it, commit to your own yoga practice and you’ll soon be asking yourself why in the world it took you so long to start. Begin your practice at AYC! Try our free Intro to Yoga class every Monday evening in January from 5:45-6:45pm or purchase an Intro Special with 6 classes for just $6 each. Even for all of you work out enthusiasts, the winter months can be a serious drag when it comes to being motivated to exercise. The cold, dark mornings and evenings just make you want to sit at home curled up by the fire. Winter is nowhere near as encouraging to be outside. We get it. None the less, it doesn’t mean that you should stop caring and showing love to your body. Consistent exercise boosts the immune system and can help you stay healthy when sicknesses arise. So why not take the colder months to revive your body and work on your yoga practice? Here are some reasons why you should take up yoga this winter. The cold temperatures of winter create stiff joints and enhance chronic joint pain. Vinyasa, a flowing form of yoga, provides a way to maintain joint mobility and increase circulation to loosen any stiffness you might be experiencing. If you’ve ever tried to exercise outside when it’s cold you know that breathing in that air creates an uncomfortable burning sensation in the lungs. Yoga is a great way to work on your breathing without having to expose your body to the harsh temperatures of winter. Steady breathing through the nose warms air before it enters the lungs, eliminating any constrictions that result from cold air entering the body. Breathing through the nose can aid in decreasing any nasal congestion and clear out the sinuses. Practicing yoga in a room set to a high temperature can help you sweat out any toxins while simultaneously boosting the immune system. A body flooded with toxins is much more likely to succumb to illness. However, sweating, combined with yoga movement, can help cleanse the body of viruses and congestion. It’s no secret that the holidays are a stressful time for just about everyone. It’s a busy time that’s jam-packed with shopping and social events. Practicing yoga can help reduce stress and elevate your mood. Stress is the body’s ultimate nemesis when it comes to staying healthy. Your body doesn’t have the same capabilities to fight germs when it’s undergoing physical and mental tension. However, meditation can help, and that’s where yoga really becomes an asset to the body. Just as little as ten minutes of daily meditation can lower tension. So eliminate that unwanted stress! If you want to feel reinvigorated, energized and healthy this winter come see us! If you’re new to yoga, get started by taking our FREE Intro to Yoga class every Monday in January. If you’re a little more seasoned, we offer 6 classes for just 36 dollars with our Intro Special. Choose from over 100 classes offered weekly at the convenience of your schedule. Stay healthy with more yoga this winter! In 1981, the United Nations declared September 21 as the International Day of Peace to be observed around the world annually. This momentous day provides an opportunity for all of humanity to leave all differences at the door and come together as one body to focus on building a worldwide culture of peace. Here are a few fun facts about this day of peace! The Moment of Silence, or Minute of Silence, was established in 1984 as a way to commemorate International Day of Peace. At noon, in each time zone around the world, there is a Moment of Silence to initiate a “Peace Wave” globally. Every individual, community and nation is encouraged to participate in this peaceful act. Iceland comes in first as the most peaceful country in the world according to the Institute for Economics and Peace. You might be surprised to know that this is actually the tenth year in a row that Iceland has garnered this title! This nation of 350,000 citizens has no standing army, navy or air force and is the smallest of any NATO member state. Icelanders enjoy record-low crime rates and consider tension between economic classes to be non-existent. In 2017, the Nobel Peace Prize was awarded to International Campaign to Abolish Nuclear Weapons (ICAN). The organization was recognized for its work to bring to light the consequences of nuclear weapons on humanity and for efforts to accomplish a treaty-based prohibition of these weapons. This year’s Nobel Peace Prize winner will be announced on Friday, October 5. Take this day as an opportunity to reflect on what peace means to you and what kind of peaceful impact you can have on yourself and your community. Whether it’s a few more minutes on your yoga mat, or taking the time to make a difference in someone else’s life, International Day of Peace is a day for reflection and change. You’re thinking about going to your very first yoga class. You’re wondering what the flow of class will be like and what kinds of poses you’ll learn from your yoga instructor. It’s always a little scary to try something new, but taking a yoga class is a great way to add variety to your weekly workout routine! Beyond that, the mental and emotional benefits of yoga are a great addition to any wellness regimen. Your instructors have all completed extensive yoga teacher trainings to assist you with your newfound practice. Remember, yoga should be practiced at your own pace and shouldn’t be strenuous on your body. Let’s talk through some of the poses you may encounter during your first yoga class! You’ll see this pose as part of the warm up in your yoga class. It’s an opportunity to check in with your body, breath and mind. It begins by standing tall with a long spine and keeping your feet close together. The benefit of the Mountain Pose is that it improves posture and balance while simultaneously strengthening lower body muscles. This next pose builds on the structure of the Mountain Pose. You’ll bend forward from the Mountain Pose, placing your hands where they’re comfortable. It is encouraged to slightly bend your knees or keep your arms folded so as not to hurt your hamstrings. 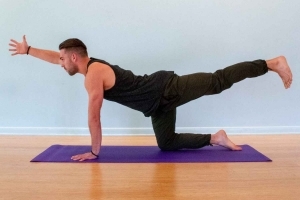 This pose will release tension in the back of the legs and strengthen the lower body. 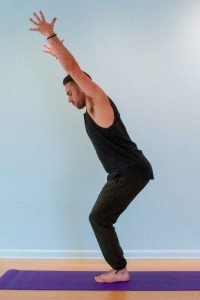 This pose serves as home base for a wide variety of movements. It’s an essential pose for any beginner, because it can take the place of other more challenging postures like Plank or Downward-Facing Dog. To enter Table Top, position yourself on hands and knees with a flat back. Ensure your wrists are directly below your shoulders and knees directly below your hips. From here, you can alternate between arching your back and rounding your back for a comprehensive spinal stretch, also known as Cat-Cow Pose. This pose improves core strength and stability, as well as spinal mobility. Even if you’ve never practiced yoga, you’ve probably seen or at least heard of this pose. This pose begins in Table Top with your hands slightly further forward then slowly lifting your hips. Your arms should be strong and your shoulders wide. The goal is to maintain a straight line from your wrists to your hips, so it’s encouraged to bend your knees at first to maintain this alignment. Alternatively, try Melting Heart Pose, with your knees on the mat for a more accessible posture. Downward-Facing Dog is excellent for balance, strength and flexibility. If you want to relax, this is the pose for you. To enter child’s pose you start in Table Top then sit your hips back on your heels. Your arms can be extended in front of you or down by your sides. This pose gently stretches the hips, thighs and ankles while relieving the back and neck. A lot of introductory yoga classes will incorporate this pose instead of Downward-Facing Dog for added relaxation. By the end of your first yoga class you may find that your muscles feel more relaxed and you stand just a little taller. You may leave the studio feeling energized, rejuvenated and ready to take on the rest of your day. But don’t take our word for it, come try it yourself! You may be surprised by what you discover. With so many different types of yoga out there, it can be challenging to stay informed of each style. But in the spirit of a holistic yoga practice, we should strive to learn more about other approaches and, if appropriate, integrate them into our own practice or teaching. Our yoga teacher training blog has covered various types of yoga already, but today we’re going to focus on Kundalini yoga. It is among one of the oldest lineages and predates most other types of yoga, especially those being offered in modern studios. Kundalini is the practice of discovering untapped energy held at the base of the spine that can be brought up through the body to awaken each of the chakras. Kundalini yoga is an incredibly impactful tool for expanding awareness. “Kundalini awakening,” reached through a combination of movement, deep breathing, meditation and the chanting of mantras, results in an incredibly positive, energized and focused feeling. Practicing Kundalini yoga helps create resilience, strength and vitality, and leaves you feeling renewed and even exhilarated. Kundalini yoga incorporates sound, breath and postures to awaken and channel this source of energy. Postures for Kundalini combine breathing techniques with poses focused on the naval, spine and other key energy points. Exercises may include breath of fire while doing a backbend, deep one-nostril or alternate-nostril breathing, shoulder stands, and seated meditations while chanting mantras. Kundalini is worth incorporating into your yoga practice as a way to connect to your inner potential, respond to the things during your day that drain energy, and find renewed energy and vitality. Through chanting mantras, focused breathing and opening postures, kundalini expands our inner vitality. Yoga class should be an enjoyable and uplifting experience. It should leave you feeling better and more energized than when you first stepped into the studio. There are many aspects to yoga classes, and hands-on assists are one tool that instructors use to enhance their practice and your personal experience. If you’re someone who prefers not to have hands-on assists, remember to arrive early to class to speak to your yoga instructor about it. What is the Reasoning Behind Hands-On Assists? A hands-on yoga assist is the physical act of stretching, moving, pressing, or touching someone while they’re in a yoga posture and intentionally takes them deeper into a pose and corrects misalignments. Hands-on assists are used in order to help students find better alignment, extension, and greater stability. They are tools to help students have better access to certain poses so that they are benefiting as much as possible from each movement. Not only do hands-on assists improve movement, but they reduce the risk of potential injury as well. The wonderful part about hands-on assists is that they can transform a student’s journey as they enter, experience, and leave poses. They also eliminate unnecessary struggling so that students can enjoy a safer and more rewarding experience. Touch is an intimate act, and in some cases, can be a harmful trigger. Yoga class should be a safe space for you to relax, rejuvenate and re-connect with yourself and your body. We are all unique in our own way. We come from different walks of life and different backgrounds. Something that you’re comfortable with might make someone else very uncomfortable, and there’s absolutely nothing wrong with that, which is why it’s important to speak with your instructor prior to class if you do not want to receive hands-on-assists. Some students have gone through incredibly traumatic experiences throughout the course of their lives, so having instructors give hands-on assistance brings back painful memories. The bottom line is hands-on assists should never be a painful experience. Remember, it’s important to notify your instructor of your concerns, so that they can be aware of your needs. Yoga class should be a positive experience for you as well as for your instructor. Instructors use hands-on assists for a variety of reasons, whether it’s for greater stability or to help you through certain poses. Most yoga instructors will ask for consent before class begins, but some will not. If an instructor does not ask if you’d like hands-on assists, then it’s up to you to voice your preference. Every instructor is different, and they all have different methods they like to use. Some instructors might ask you to raise your hand at the beginning of class if you’d prefer to opt out of hands on-assists. Others instructors will use cards or give you a prop to place at the edge of your yoga mat to indicate your preference. We want you to be comfortable. Please arrive early to class and speak with your instructor if you’d rather not have hands-on assists. In any given yoga class you may have heard the phrase, “draw the belly in toward the spine,” or at least something similar. This fundamental and common cue has been used by many yoga and fitness professionals across the board to communicate something that has great value to spinal and abdominal organ health. Unfortunately, at times fundamentals can be pushed aside during class, so unless you are in a workshop or working one-on-one with an instructor, you may not get a thorough explanation of what the draw-in maneuver accomplishes for you. Our core is considered most of our torso and essentially our center of gravity. More specifically it is made up of the lumbo-pelvic-hip complex. This complex includes the lumbar spine, pelvic girdle, abdomen, and the hip joint. Our abdomen — especially the transversus abdominis— and a little bit of the pelvic floor are the focus during the draw-in maneuver. The draw-in maneuver is the activation of the deepest layer of abdominal tissue called the transversus abdominis. This muscle is made of horizontal fibers and runs between the rib cage and the pelvis. When activated properly, the muscle fibers contract and your belly draws in, recruiting the transversus abdominis and pelvic floor. This action also compresses all the abdominal contents, which helps support the organs and lumbar spine. Imagine yourself squeezing and buttoning up the tightest pants in the universe. That’s the maneuver I’m talking about. Building strength and awareness in this area can take time, so patience is key. The more you practice, the more endurance and strength you build. Begin by drawing the belly in and contracting. Hold for short intervals to build a neural drive, which creates a stronger contractile signal to that area from your nervous system. Do not completely cut off your breath. You can breathe while engaged, but your breath may not be as deep as normal. After you become more developed and aware of the drawing-in method, you can apply this to your practice. Especially before you initiate movement or hold a posture. You can practice this in many ways, but below are a few postures where you can build some deep abdominal strength and awareness. Chair is a symmetrical posture that can be ideal for practicing the draw-in maneuver. 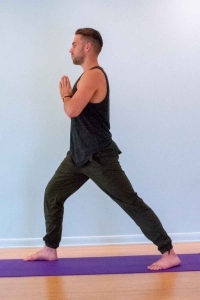 From standing (mountain pose) bend the knees to allow the knees to project over the feet. The torso will hinge from the hips and lean slightly over thighs. In this variation to practice the draw-in maneuver, allow your cervical spine to stay in a neutral position. Draw the belly in and maintain contraction for 3-5 breaths. You may start with hands at heart center or arms extended. Warrior 1 is a great pose to practice drawing in the abdomen in an asymmetrical posture. For this variation, step your feet about 31/2 to 4 feet apart. Back foot can be at a 45-degree angle with the toes pointing to the outer edge of your mat. Front knee is bent. Hands can be at heart center or extending overhead. As you stand with spine long and neutral, draw the belly in towards the spine. Even though you are contracting abdominal muscles, do your best to have a steady breath. Hold here for 3-5 breaths with a focus on staying contained in the core. Repeat on the other side. Once you have achieved some strength and awareness with drawing the belly in with a neutral spine, you can take it a little farther. To begin this spinal balance posture, start on all fours in table. Extend your left leg back and allow it to be parallel to the floor. Extend right arm, parallel to the floor. Keep head and spine neutral at the start and draw the belly in. Once you feel strong and stable you can now take this into more of a backbend by lifting your arm and leg a little higher and gaze up to where the fingers are pointing. Maintain posture for 3-5 steady breaths. Repeat on the other side. This practice can lower your chances of experiencing low back pain during yoga by strengthening the supporting muscles around the spine. It can also prepare you for more advanced abdominal movements such as Uddyana bandha, nauli kriya, and Agni Sara. Just like everything else, moderation is key. You do not want to draw your stomach in all day long, because that can overwork your muscles to the point where they become less elastic, which can subsequently limit your movement of breath. Our breath is one of the most important and fundamental aspects of our being, and we definitely do not want to bind that up. We are all doing our best to become the strongest we can, and you can use this as one of your tools to do just that! It’s no secret that the practice of yoga is therapeutic in a myriad of ways. By flowing through asanas, practicing meditation, and utilizing breathing exercises, yoga practitioners are able to reduce their stress and anxiety, increase flexibility and blood circulation, and ease both mental and physical pain. Yoga therapy goes beyond a classroom or group experience to help heal the whole person on an individual level. Yoga as we know it in the West, tends to be focused on the physical practice of asana in a group fitness setting and sometimes pranayama and meditation are incorporated. Students adapt their practice to fit in with the style of yoga being taught. Therapeutic yoga, on the other hand, is focused on the practitioner, and takes a multifaceted approach to yoga traditions to help improve the practitioner’s overall quality of life. For this reason, therapeutic yoga is used by both physical therapists and psychologists to heal chronic pain and emotional trauma, among many other ailments. Instead of a traditional yoga class that teaches a single practice to a large group of people, therapeutic yoga is typically held in a private, one-on-one session to accurately assess the needs of the clients. Therapeutically-oriented yoga instructors help clients find ways to heal through yoga, offering tools and resources based on the individual’s needs. According to the International Association of Yoga Therapists, Yoga therapy is the process of empowering individuals to progress toward improved health and well-being through the application of the teachings and practices of Yoga. While this includes asana practice, the practice of yoga for therapeutic benefits extends beyond focusing on the physical body to tap into all five layers of being. These layers are known as the Koshas. You are already familiar with Annamaya Kosha, as it is the only tactile Kosha you can actually see. The yogic practice of asanas supports the first Kosha, strengthening and healing the physical body that encompasses the remaining four Koshas. The second Kosha, Pranamaya, is the energy layer of our bodies that can be compared with human physiology. The second body encompasses our breathing, digestion, and biological processes. As its name suggests, the second body is fueled by breath practice, pranayama, as these exercises deliver oxygen-rich blood to all corners of the body. The third body is responsible for our motor and sensory skills, and provides us with awareness. This body is nourished by the practice of mantra meditation, which soothes and restores our mental state — relieving anxiety and obsessions by clearing the mind. The fourth body can be translated as “intellect” or “wisdom,” but it also encompasses the subtle mental processes of conscience and willpower. To strengthen this kosha, ancient yogis developed the yamas and niyamas, rules and restraints that yoga students are asked to uphold. By making a conscious effort not to lie, steal, harm, overindulge, or desire more than you actually need, you will find a sense of contentment and clarity that improves your overall quality of life. The fifth and final body is one that very few people are able to fully experience. In fact, it is thought that only saints and sages are able to experience this body in day-to-day life. By activating the bliss body, you are achieving your deepest level of being, and experiencing the purest form of peace, joy, and love. Teaching therapeutic yoga requires specialized training to ensure that you are able to help your clients heal safely and effectively. While many programs can take years to complete, Asheville Yoga Center offers a Therapeutically Oriented 300-Hour Teacher Training that will prepare you to work one-on-one with clients in as little as nine months. If you are ready to get started on the next chapter of your yoga journey as a Therapeutically Oriented instructor, go to https://youryoga.com/300-hour-therapeutic-yoga-certification-2/.